Pizza Pizza has a great new Christmas printable (or you can present it on your phone) coupon. 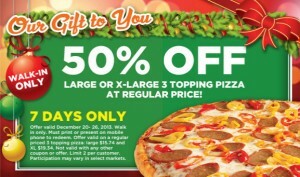 Get 50% off large or X-large 3 topping pizza at regular price. This Pizza Pizza offer is valid from December 20th till the 26th, 2013. 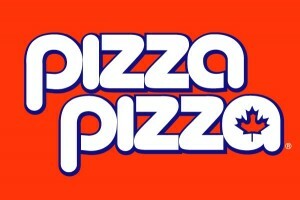 Pizza Pizza coupon valid on walk in orders only. Not valid with any other Pizza Pizza coupon or offer. Limit 2 per customer. Participation may vary in select markets. Hmmm I hate that last sentence. It basically makes it okay for a Pizza Pizza store to reject the coupon without giving a good reason.